The school participates in Shobha Yatra and bags the 1st prize for the third time consecutively for its sensitive portrayal of the condition of women and their empowerment. KBDAV-7 students overshadow 85 participants from various tri-city schools in the Gita Recitation Contest held in association with Sri Gita Prachar Samiti (Regd. ), Haryana by winning 50 prizes comprising of Rs. 100/- cash, trophy and books for recitation of a complete Chapter from the Gita. Nishtha, Priya and Zadjiya win the 1st, 2nd and 3rd prize for recitation of any chapter of the Gita, along with a cash prize of Rs. 200 each. Winners of the 1st prize in the recitation of 10 shalokas (Chapter 9 and 10) are Dikshu (Class X-D), Shreya (Class IX-A), Akanshi (Class VIII-A), Kanishtha (Class VI-A) and Sakshi (Class VI-A) followed by Arjun (Class X-D), Aditi (Class IX-A), Tejal (Class VIII-A), Shreshth (Class VI-A), winning 2nd prize and Manik (Class X-D), Nikhil (Class IX-A), Shraddha (Class VII-A), Prakhar (Class VI-A), winning 3rd prize in the same category. The Staff and Students celebrate the International Literacy Day in the campus. Poster competitions, extempore and recitation competitions are held for students of Saral Ahsaas, in collaboration with Inner Wheel Club. Principal Mrs. Madhu Bahl makes an endeavour to keep the senior wing abreast with the courses and prospects abroad. Experts from Canadian Embassy visit the school to introduce the students about courses in Animation. The campus is converted into a vibrant learning experience as students dress up to bring the feel of Ayodhya. Swami Sumedha Nand, the religious head of Arya Samaj and Principal join in the Rajya-Abhishek of students attired Lord Rama, Sita and Lakshman. Saral Ahsaas learners received gift hampers including stationery woolens, candles and chocolates etc. by the dignitaries. Principal furls the Tri-colour National Flag and kicks off a patriotic fervor among the learners who express love for their country, through their creative self expression. Each class gets a chance to organize and present a colourful and lively cultural event. The school dance troupe receive participation certificates from Education Department, Chandigarh for their dance performance in the Independence Day Celebrations, 2012 at Parade Ground, Chandigarh. The students learn through stimulated environment and values are promoted creatively with the help of visual arts. The school organized an Exhibition on Janamashtmi celebrations and the Yagyashala was converted into a visual delight with bright hues and Lord Krishna's cradle surrounded by dancing Radhas, with the Principal joining in the Rasleela. Swami Sumedha Nand, the religious Guru / Head of Arya Samaj, President, All India Arya Pratinidhi Sabha, New Delhi took up the cudgels to fight and uproot corruption from the society. He called for the DAV Institutions to join hands and re-energize the DAV Body by connecting with people at grass-root level. His motivational speech inspired one and all as he called for a Yagya to be held where Arya Samajists from all over the country would come. 500 Enthusiastic Peace Club members of school participated in the Shobha Yatra to celebrate the 188th Birth Anniversary of Maharishi Dayanand Saraswati to propagate the vedic teachings of the learned Arya Samaj members, who showed the path of enlightenment to the common man. The school students won the 1st Prize in the Rally conducted through the city to keep the message alive. Decoration of Rath won the 1st prize for participation in Shobha Yatra. A workshop on “Personal Grooming – to enhance Personal Skills and Work Ethics” is conducted by Principal Mrs. Madhu Bahl for the Class IV Employees of Tricity DAV Institutions. A Punjabi Skit, Power-point Presentation, an Activity, Questionnaire followed by musical chairs and tea made the workshop a resounding success. Held in a phased manner, 65 Class IV Employees attended the First workshop followed by 52 employees later. In a high-tech light and sound 3-hour live show, the Theatre Club of KBDAV-7 performed “Ramayana”, the timeless Epic. Highly melodious and soul-stirring incidents reminded one and all of the need to aspire for lofty ideas of conduct, character and morality. Prominent Guests gracing the occasion were Justice A.L. Bahri, Vice President, DAV CMC, New Delhi, Dr. R.S. 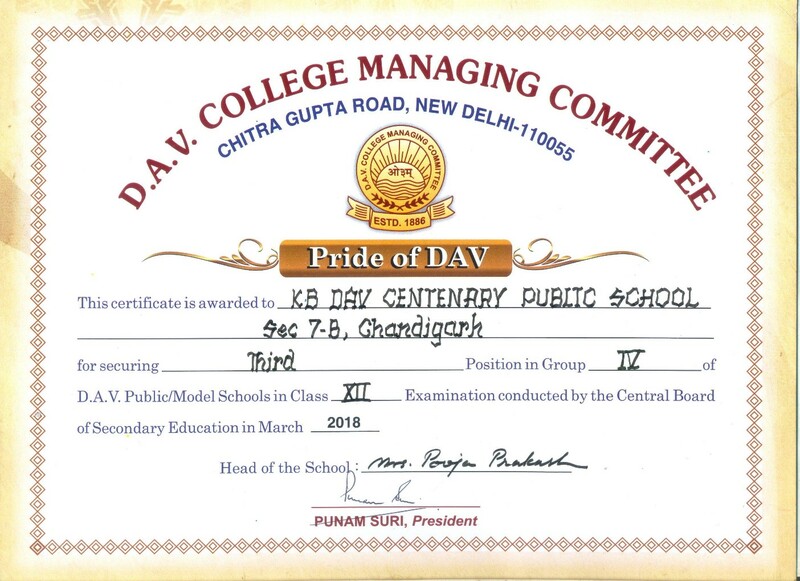 Khandpur, Director, Pushpa Gujral Science City, Kapurthala, Dr. Subhash Marriya, Regional Director, DAV Public Schools, UP Zone and Manager of the School along with distinguished Principals of DAV Schools, parents and school students. received gift hampers including stationery, woolens, candles and chocolates before proceeding for Diwali Break. As students joined hands for a cause, school fetched Consolation Prize in the Shobha Yatra conducted on the 167th Birth Anniversary Celebrations of Maharishi Dayanand Saraswati in which all the Arya Samaj and DAV Institutions participated. To celebrate Human Rights Day, children raised several issues of child labour, racial discrimination, terrorism, rights through Power-Point Presentation, Poster Making Competitions and Quiz. Principal Madhu Bahl visited Burail Jail, Chandigarh to celebrate the festival of lights with 100 inmates of Burail Jail with a mission to inculcate the Gandhian values of peace & harmony on the auspicious day of Diwali. Great feeling of satisfaction was felt on seeing smiles on inmates,’ faces when sweets & chocolates were distributed among them. 350 Saral Ahsaas students were given notebooks, chocolates and candles on the occasion of Diwali. Enthusiastic students from Saral Ahsaas received the token of love at the hands of Principal Madhu Bahl. KB DAV-7, Chandigarh hosted a visit of delegates from US Embassy, New Delhi with a “mission to promote peace messages of the budding city enthusiasts, to be projected on a “global level”. The Chief Guest, Mr. Paul Herman, Chief of Immigrant Visa Services at US Embassy, New Delhi appreciated the efforts of Campaign Peace City and the KBDAV-7 Peace Members to promote culture of peace and non-violence. The highpoint of the visit was to discuss the upcoming 4th International Peace Festival to be held at Chandigarh from 27.09.2009 to 01.10.2009. Peace Club of KBDAV-7 in association with Yuvsatta organized Valedictory Programme of Project ‘V Care’ at KB DAV-7. The special attraction of the day was a demo Basketball match by Army's internationally recognized ‘WHEEL CHAIR BASKETBALL TEAM’ of Paraplegic Rehabilitation Centre (PRC), Mohali. PRC in Mohali is working for the rehabilitation of soldiers with spinal injuries. Children witnessed the courage of conviction with which these players played and their struggle against all odds in life. The young ones also learnt the need to combine coordination, speed & endurance. Mr. B.C. Gupta, Principal Secretary, Government of Punjab was the Chief Guest and Zila Sainik Welfare Officer Col. R.K. Singh, Rtd., presided on the occasion. 40 Volunteer members for the Peace Club visited Paraplegic Rehabilitation Centre, Mohali. Students were encouraged after getting a peep into the lives of injured soldiers, who are taking vocational training in spite of disabilities to live a dignified life. Global Hand Washing Day was observed in school for school students. 40 Active peace members of school took tips on hand washing from Cricketer Sachin Tendulkar. A Handicraft Exhibition was put up for school children to promote human values by selling wisdom cards and handicraft items. Mr. S.K. Setia, DPI (Schools) inaugurated the exhibition. Defence to award certificates for essay competitions to jail inmates. There were certain inmates who were on their way to complete their Ph.D. and Business Management Courses. Principal Madhu Bahl was impressed that IGNOU was holding classes for the inmates, but touched upon the fact that all could not make use of it due to the lack of funds. She announced a grant of Rs.11,000/- for education and assured that she would always be there to help anybody for any educational cause. Mrs. Madhu Bahl visited the cells of the prisoners and also talked to them. The students of KB DAV-7 donated medicines and relief material worth Rs.50,000/- for the flood victims in Karnataka. School Management donated the money for the flood stricken people in Belgaum, Karnataka on August 26, 2005.